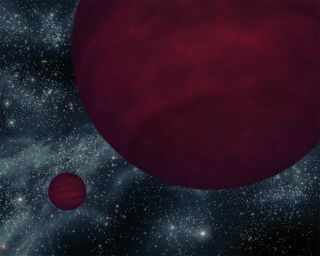 This artist's concept shows the brown dwarf twins, the dimmest pair of star-like bodies known to date, referred to as 2M 0939. The twins, which are about the same size, are drawn as if they were viewed close to one of the bodies. A pair offailed stars takes the record of being the dimmest bulbs ever detected,astronomers find.? Each of thesubstellar objects, called browndwarfs, is one million times fainter than the sun in total light on theelectromagnetic spectrum, and at least one billion times fainter in visiblelight alone. A browndwarf is a compact ball of gas floating freely in space that's toocool and lightweight to generate the thermonuclear fusion that powers realstars, but too warm and massive to be considered a planet. "Thesebrown dwarfs are the lowest-power stellar light bulbs in the sky that we knowof," said lead researcher Adam Burgasser, a physicist at MIT. Thefindings were published in the Astrophysical Journal Letters on Dec. 10. Until now,astronomers thought this dim duo was a single, faint brown dwarf. Past researchhas shown the object is the fifth closest known brown dwarf to us, 17light-years away toward the constellation Antlia. One light-year is thedistance light will travel in a year, or about 6 trillion miles (10 trillionkilometers). Here's howthe team found the singlet was actually twins: They observed the object ininfrared light using NASA's Spitzer Space Telescope. The data showed that whatwas still thought to be a single object had a warm atmospheric temperature of560 to 680 degrees Fahrenheit (293 to 360 degrees Celsius). While this ishundreds of degrees hotterthan Jupiter, it's still downright cold as far as stars go. In fact,the brown dwarfs, called 2MASS J09393548-2448279, or 2M 0939 for short, areamong the coldest brown dwarfs measured so far. They alsoestimated the brightness, which they found to be twice what would be expectedfor a brown dwarf with its particular temperature. The solution: The objectmust have twice the surface area. So each body shines only half as bright, andeach has a mass of 30 to 40 times that of Jupiter. Burgassersaid that studying these objects could help astronomers understand details ofbrown dwarf structure and evolution. The workwas funded in part by a NASA grant.